Absolute Perfection Pigments have revolutionized the world of Permanent Cosmetic pigments. Our top-class formula produces a pigment that is rich and creamy, allowing you to use less of the product in each application while obtaining better results. The high viscosity also promotes accurate, long-lasting color retention - which translates into satisfied clients. This 1oz. Absolute Perfection 21-Color Kit includes bottles of every color you will need to carry out your procedures - from eyeliner to corrective pigment camouflage. 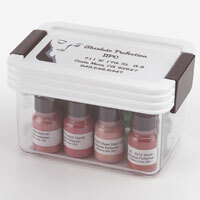 In addition, all Absolute Perfection pigments mix together effortlessly should you choose to custom blend. If you want the best option in color, you should accept nothing but Absolute Perfection. After all, isn't that the ultimate goal? Cap holder displays pigment caps so you can see and access them easily during procedures. It accommodates 3 small caps and 3 large caps together. Clear plastic caps for holding pigment and preventing cross-contamination in during Permanent Makeup and Microblading procedures. Order in 100, 500 & 1000 count quantities. Durable squeeze bottle with anti-clog spout, safety tip and mixing pellet. Choose 1/4oz , 1/2oz , or 1oz bottles.